When I spotted this rusty/terracotta/ginger coloured coat I knew it had to be mine. It is in a cut I confess I wasn't too sure would flatter my figure, but it is so comfy and roomy I can just see myself layering big chunky knits underneath when the truly harsh weather makes an appearance. Despite being stunning, I also thought this rust colour would be difficult to pair, but how wrong was I. It goes well with white, black, denim and alike earthy tones. 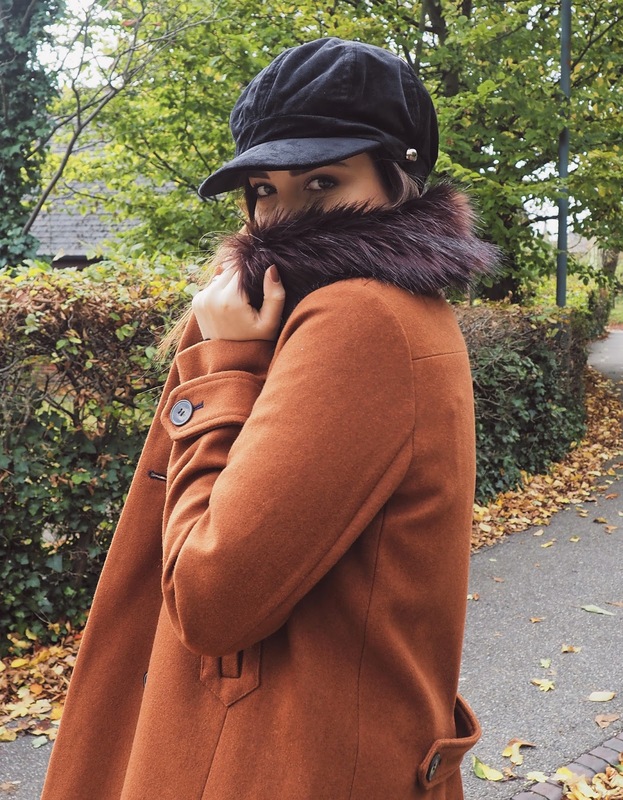 The coat also has a detachable faux fur collar, perfect to add that extra touch of glam to an outfit. All in all, it is a beautifully made coat, in a gorgeous eye-popping colour and oh so incredibly comfy, plus it was on sale, what's not to love! 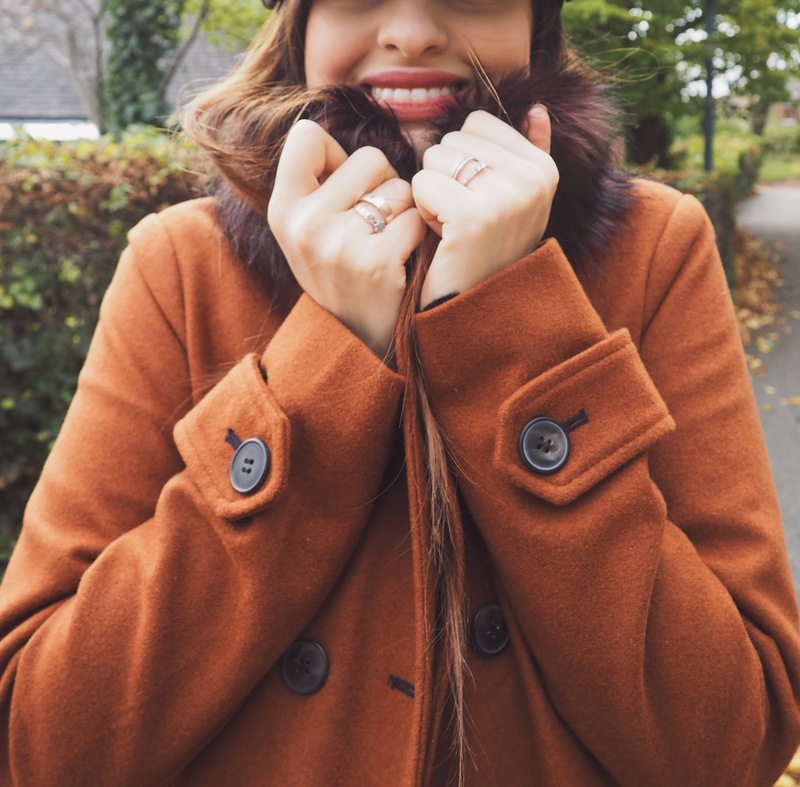 This trend has exploded all over social media, and I've always loved a good wintery hat so I had to add this to my wardrobe. The newsboy cap is a hat of the 19th century, favoured by working boys then. Today the piece is very much du jour, and best yet, it suits almost all face shapes and it is very easy to wear. You can wear the design with everything from a dress to jeans, making it indeed a fashion girl's must-have item for the season. 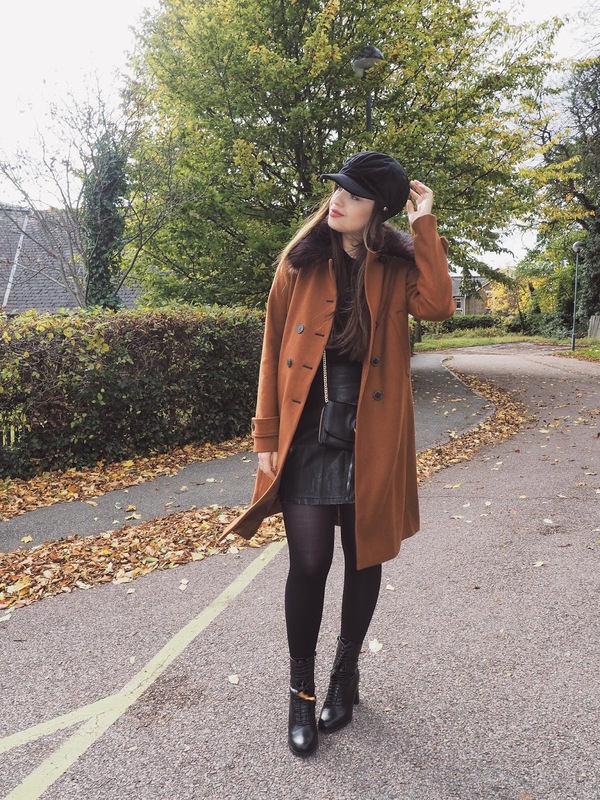 Wanting to draw attention to the colour of the coat, I went for an all-black outfit and I must say those are my favourite for this time of year. Adding a leather skirt to any outfit instantly makes it more stylish and these boots have been on my feet on repeat so it was a no-brainer. They were also a find on lovethesales.com and what can I say, best boots ever! 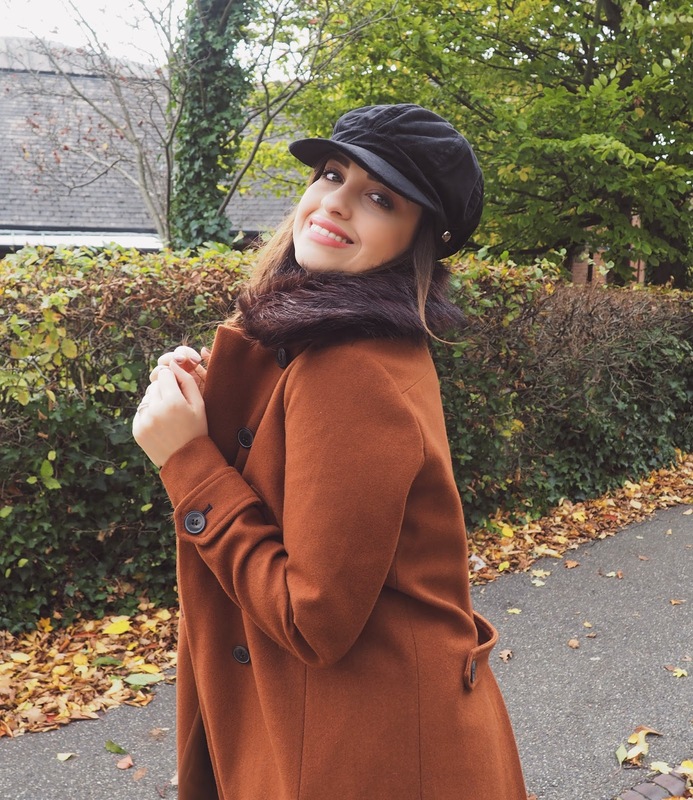 Looking back at the photos, I would lose the bag but otherwise, this is one outfit I will be counting on this season for when I want to fill glammed up but cosy. Check out Lovethesales.com Faux Fur Coat Sale! Have you gone coat shopping yet? Will you be adding some colour to your wardrobe too? Let me know below beauties! Thanks for reading and a wonderful day ahead to all of us! it is my perfect winter companion! love your coat and your totally right about the color trend, gorgeous look! That coat looks so comfortable! I haven't been autumn shopping yet, but I this site has really intrigued me. I love all of your picks and this coat is a hit! I would so wear this. Such a stylish coat and beautiful outfit! I have been embracing colours too, both in fashion and the beauty front. I am still not very comfortable with colours but hey, baby steps right? You look gorgeous, Pam and that coat is a beauty. thank you! I think the key is to go easy with colour :) seems like you're on the right track! Love the colour of this coat and you look great in it! That coat looks beautiful. I love the color, perfect for fall! Such a gorgeous colour, it suits you perfectly!!! Wow...such a beautiful coat...lovely color! this is such a cute coat, pam! definitely a nice pop of color to have amongst the usual black/navy/white coats! Your coat is so pretty!! Love the color. I had one about 10 years ago! So glad it's back, it is perfect for this season! 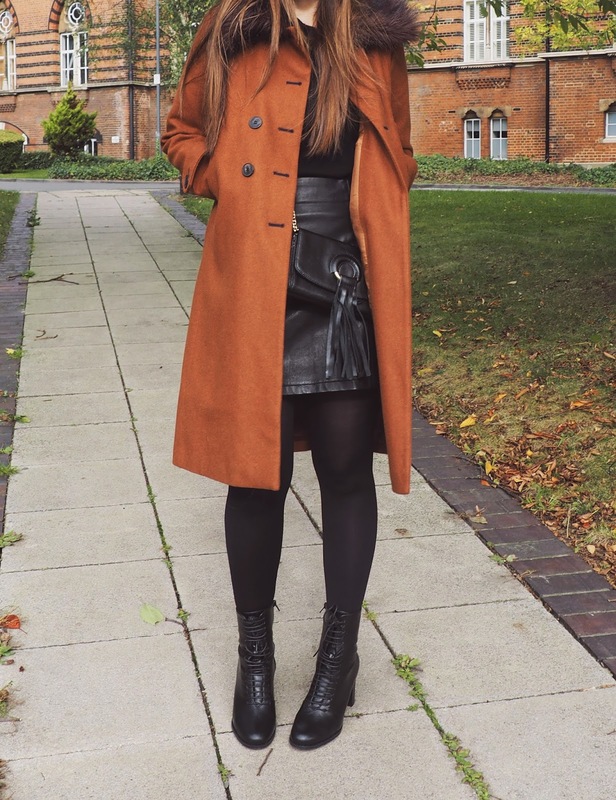 I do enjoy my fair share of black but I know what you mean as I am totally loving these autumnal rust shades at the moment. I've found myself added more colour into my wardrobe this season too. 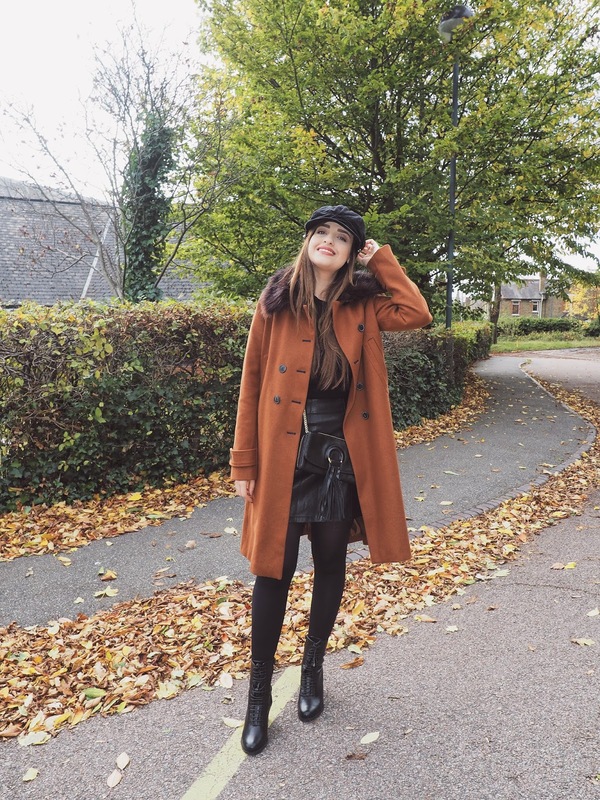 I love the colour of this coat and this whole outfit combo looks so good together! Loved the pictures, Pam, you look so sweet and beautiful as usual! Loved the colour of this coat, it is really super sweet! The quote is great - you can fake fur, but not chic :) The outfit, black, goes very well with the coat's colour! I hope you enjoy the evening! I agree with the fur issue! And yes this hat is one of my favs! Muito bonita que estás,esse casaco fica-te lindamente,as fotografias ficaram maravilhosas,gostei imenso do teu look!! This coat is stunning! It's just perfect for this season! Oooh I want one! 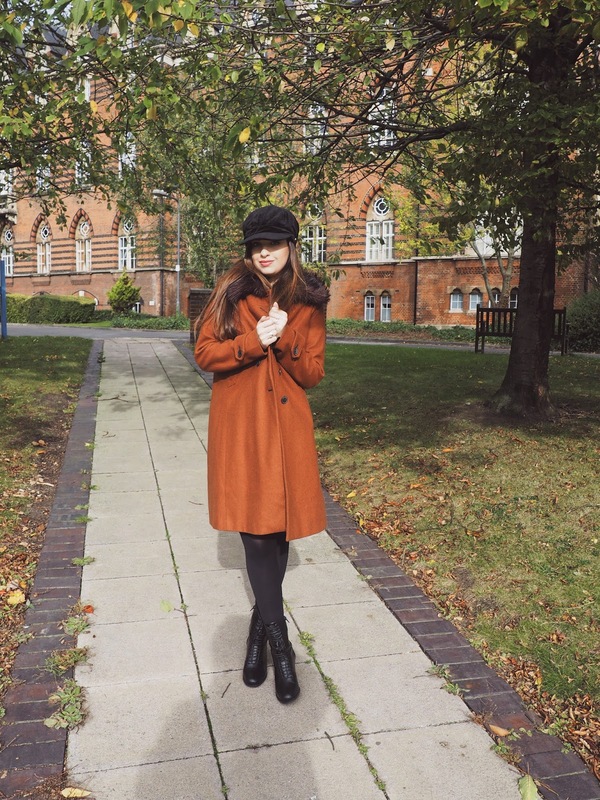 the rust coat is really the perfect for autumn! That's one lovely coat you got there dear! 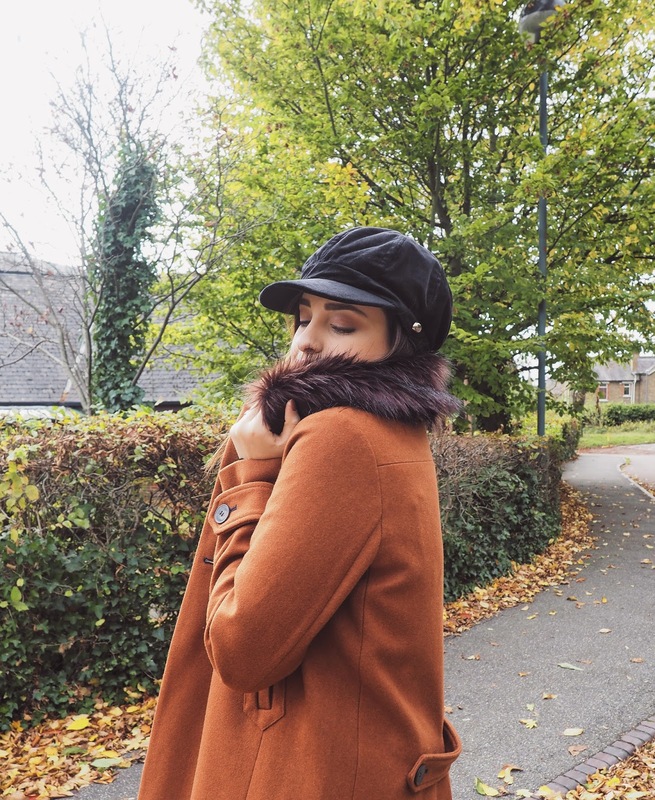 I love the faux fur collar, looks really soft and comfy, yet really stylish and edgy. Bonita foto. Bom fim de semana. That is a pretty chic fur coat.